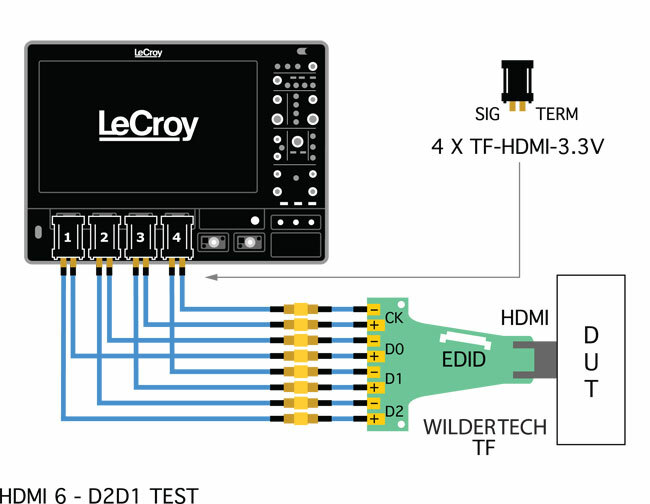 The QPHY-HDMI software package for the WaveMaster/SDA/DDA 8 Zi Oscilloscopes provides a concise set of validation/verification and debug tools written in accordance with version 1.4a of the High Definition Multimedia Interface (HDMI) electrical test specifications. 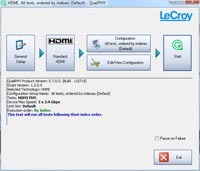 HDMI test modes covers amplitude, timing and jitter parameters. In addition to standard eye pattern and jitter tests for HDMI, the SDA real-time test equipment platform provides a complete set of amplitude and jitter measurements, as defined in the HDMI specification. 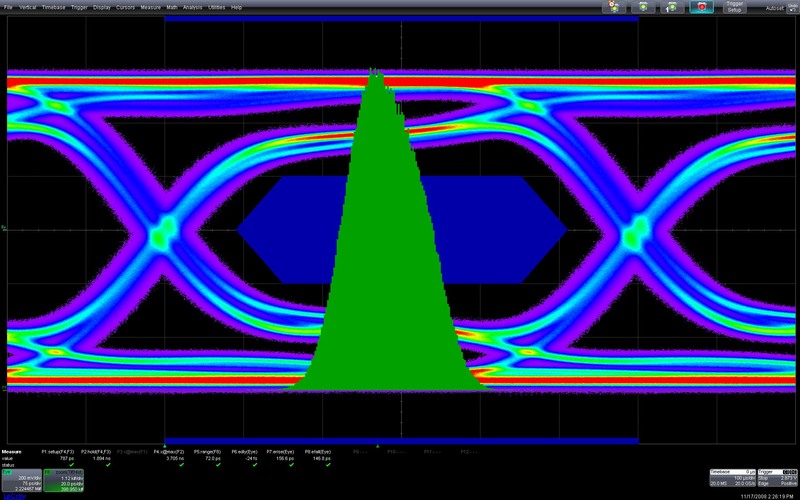 This combination of measurements makes QPHY-HDMI a cost-effective, compelling HDMI solution. Once a problem is detected, all of the power SDA tools are at your disposal to help find the root cause. Typically, compliance testing is a very difficult task. The user must make the necessary connections between the oscilloscope and the device under test, manually configure the oscilloscope for the appropriate measurement, perform the test procedure as specified by the test specification, record the results and finally compare the results to the appropriate limit in the compliance specification. 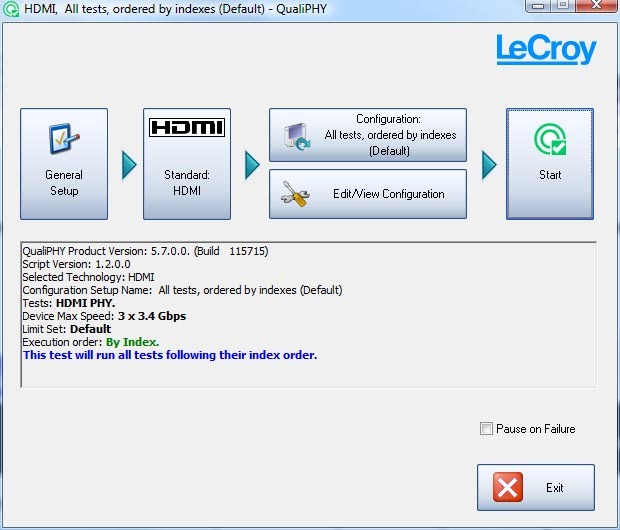 QPHY-HDMI does all of these steps for you automatically after indication of the correct connection to use. This image is showing a measurement of VL level (Test 7-2). C1 is triggered at the end of an H-L-L-L bit sequence. F2 is a zoom on the last L-L bits. P3 is the most frequent level of those L-L bits. Measurement results often need to be summarized and tabulated to quickly verify specifications. This information, together with instrument and signal acquisition/test condition setups, results in a fully documented record. 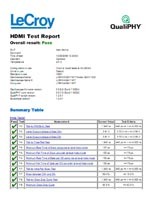 QPHY-HDMI streamlines this process by incorporating an automatic HTML report generation engine. The created test reports contain tabulated numerical values for each individual test result, including PASS/FAIL and specification limit columns. Reports can also be saved as PDF, HTML or XML. This image is a measure of Clock Rise Time (Test 7-4). F4 is the Clock. F1 is the histogram of F4 vertical levels. The two peaks correspond to base and top, they are used to compute the 20% and 80% levels. Z1 is a zoom of F4 showing the computed levels. P6 is a measure of F4 rise time at these levels. F2 is the histogram of P6 and P7 is the mode of F2, final measure as specified by the standard. 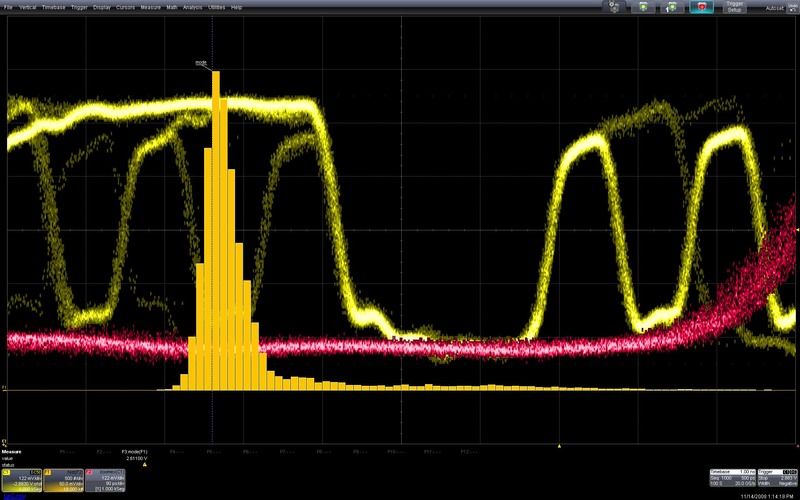 If a compliance failure is found, Teledyne LeCroy's SDA II serial data analysis package is available to help find the root cause quickly and easily. 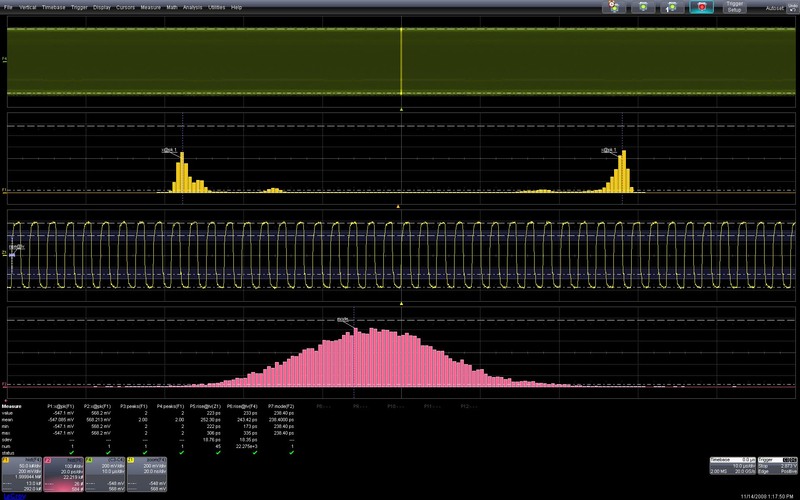 SDA II has the ability to perform Eye and Jitter measurements simultaneously and is fully integrated into the oscilloscope application software. In addition, SDA II provides insight into the measured Eye and Jitter parameters making is easier to identify the sources of problems. This image is a measure of the Eye Diagram (Test 7-10). The eye is validated against the mask as defined by the standard. QualiPHY has many predefined configurations that allow users to run complete compliance test. 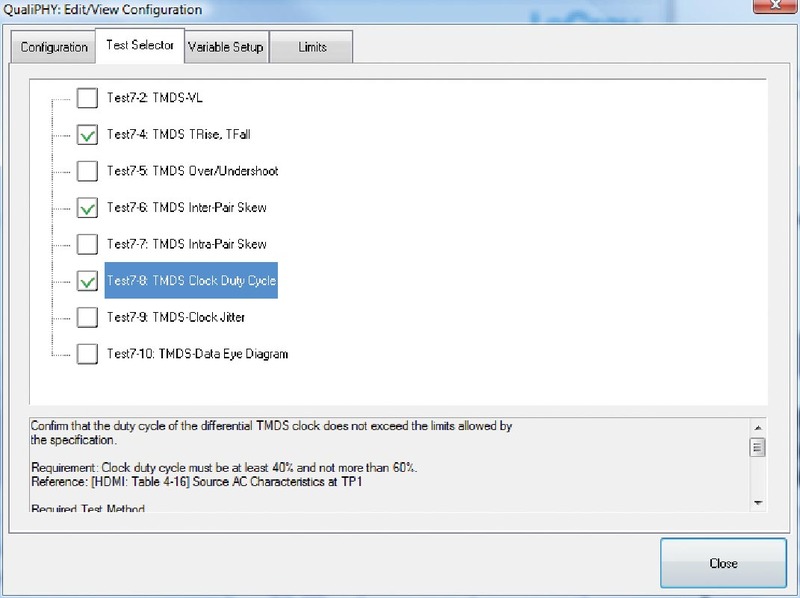 In addition, users can create their own custom test groups and limit sets. 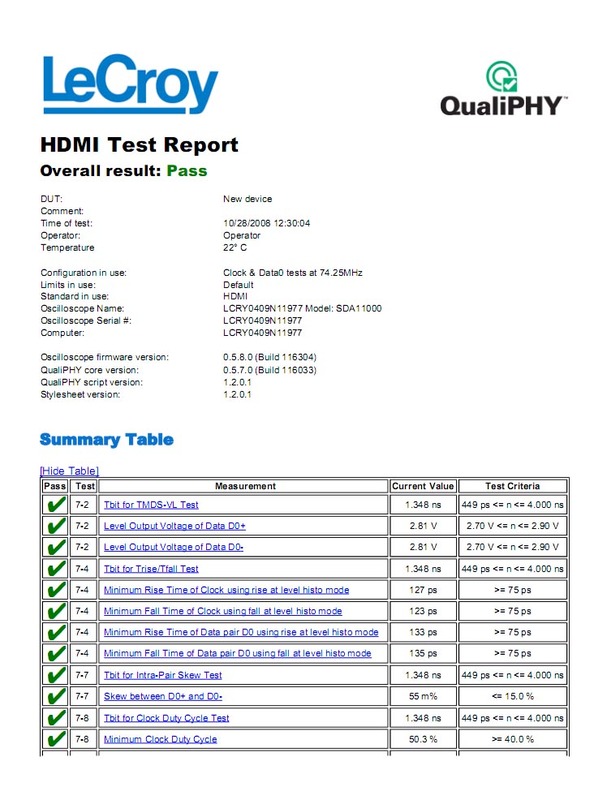 When the tests are complete, QualiPHY will generate a full test report in PDF, HTML, or XML formats (including eye diagrams and other screenshots). QualiPHY has many preset compliance configurations but also enables users to create their own configuration and limit sets. 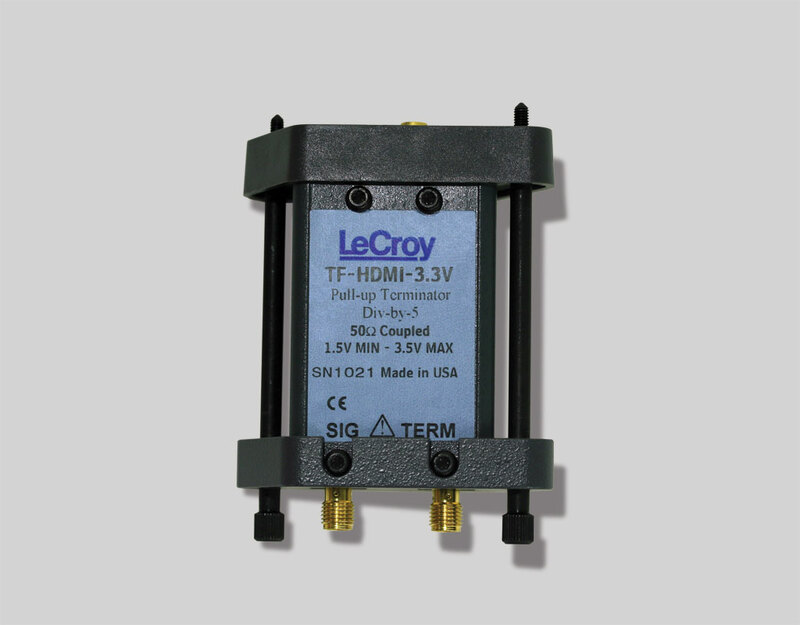 TF -HDMI-3.3 V adapter provides the necessary 3.3 V pull-up termination for HDMI testing.